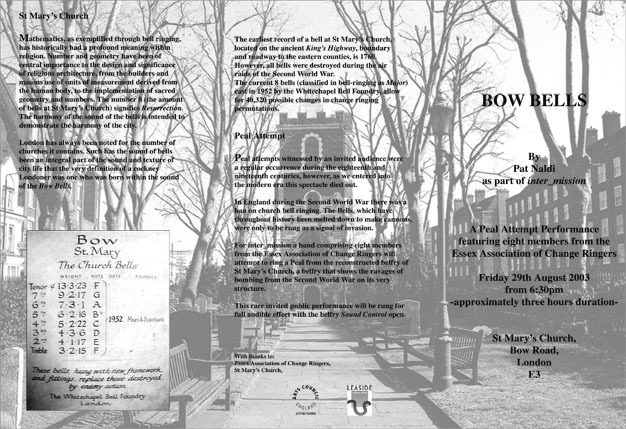 Site-specific performance event, St Mary’s Church, Bow, London. London has always been noted for the number of churches it contains. Such has the sound of bells been an integral part of the sound and texture of city life that the very definition of a cockney Londoner was one who was born within the sound of the Bow Bells. In England during World War II there was a ban on church bell ringing. 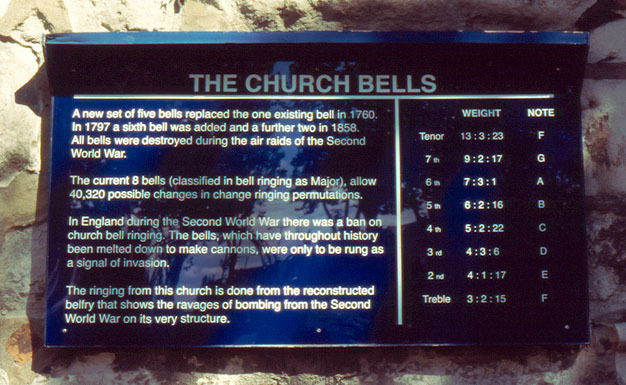 Bells, which have throughout history been melted down to make cannons, were only to be rung as a signal of invasion. For Bow Bells, a band comprising eight members from the Essex Association of Change Ringers, attempted, and completed, a full Peal on the eight bells of St Mary’s Church. Consisting of over 5000 changes, had one mistake been made at any point, the Peal would have been abandoned. Taking three and a half hours to complete, the Peal was rung from the reconstructed belfry that shows the ravages of bombing from World War II on its very structure. Peal attempts witnessed by an invited audience were a regular occurrence during the eighteenth and nineteenth centuries, however as we entered into the modern era this spectacle died out. This rare invited public performance was rung for full audible effect with the belfry Sound Control open. Inter-Mission was curated by Julia Höner. It featured installations by Lothar Goetz, Clare Qualman, and Laura White.